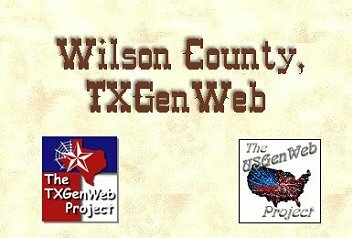 Wilson County, in the south central part of Texas, was organized by an act of the legislature of the State of Texas on February 13, 1860 from Karnes and Bexar counties. The county is named after James Charles Wilson, an early settler of Texas and later a state legislator. The area that now comprises Wilson County has been the site of human habitation for several millennia. Archeological evidence reveals that hunter-gatherer Indians of the Coahuiltecan linguistic family occupied the region for several thousand years prior to the arrival of Europeans in the sixteenth century. The area was also in the hunting range of Comanche, Tonkawa, and Lipan-Apache Indians. This website is maintained by Colleen Pustola. If you have anything to contribute, any suggestions for inclusion on the site, or simply want to send a friendly greeting, just email me! I'd love to hear from you. Our TXGenWeb State Coordinator is Shirley Cullum. If you would like to join us, have a look at the counties page. Should your county of choice already be adopted, Shirley keeps a waiting list she can add you to. PLEASE NOTE: I do not live in Texas and am unable to help you with local research. 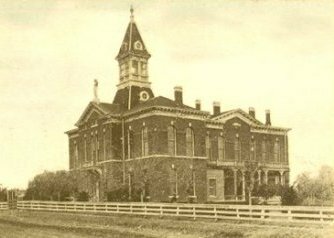 Shown above is the Wilson County Courthouse in 1912. It was added to the National Register of Historic Places in 1978. All materials contained on these pages are furnished for the free use of those engaged in researching their family origins. Any commercial use or distribution, without the consent of the host/author of these pages is prohibited. All images used on these pages were obtained from sources permitting free distribution, or generated by the author, and are subject to the same restrictions/permissions. All persons contributing material for posting on these pages do so in recognition of their free, non-commercial distribution, and further, is responsible to assure that no copyright is violated by their submission.